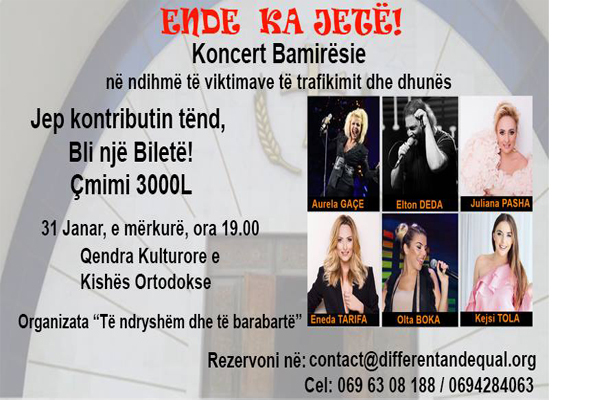 The “Different & Equal” NGO is organizing a charity concert in support of victims of trafficking and violence in Albania. With the participation of Albanian renowned singers: Aurela Gace, Elton Deda, Juliana Pasha, Eneda Tarifa, Olta Boka, Kejsi Tola. The concert will be held on January 31 at 19:00, at the Orthodox Cathedral Hall. Ticket price is: 3 000 lekë. Ticket sales will go to victims of trafficking and violence in Albania.